From the heart of Appalachia, I,Star rises… Encompassing a core fusion of husband-wife duo, MC/poet Truth-I Manifest’s potent lyrical flow, and singer/songwriter Aradhana Silvermoon’s angelic melodies- with a stellar band of multi-instrumentalists’ profoundly funky prowess- I,Star’s performances are a dynamic interplay of hard-hitting poetics weaving between evocative refrains, building to harmonies in the hooks. 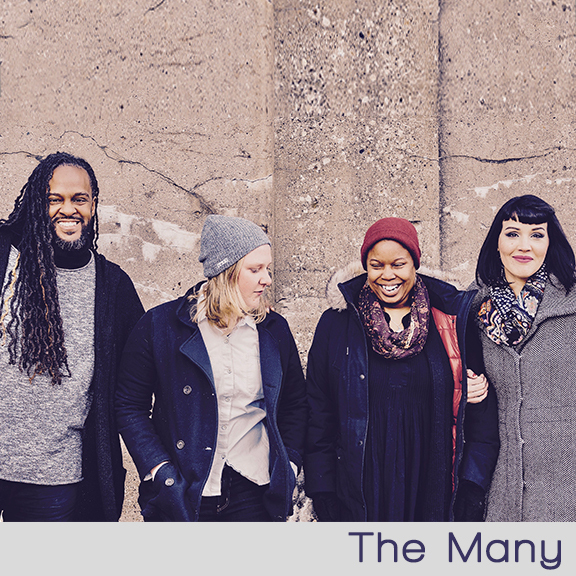 Their wholly original “folk-hop” carriage bears powerful and relevant commentary on personal and global spiritual transformation, stewardship of the Earth, social justice, and visionary love. 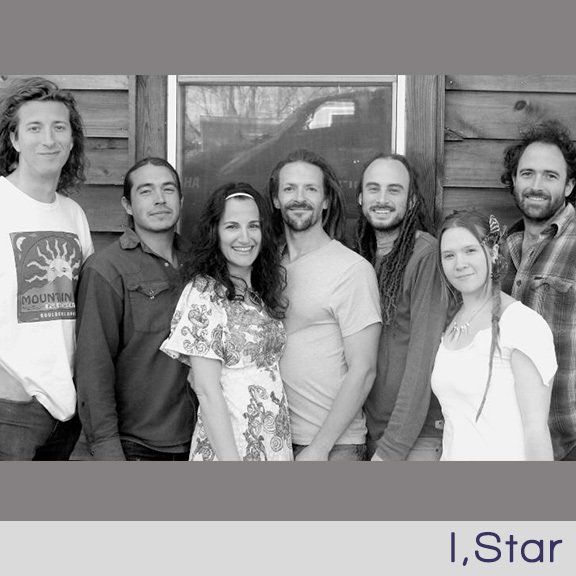 With soundscapes ranging from simplicity in Aradhana’s acoustic guitar to the complex layers of the band, I,Star inspires listeners to groove deeply and journey into their rich imagery. Singer-songwriter Sus Long met bass and banjo player Michael Conner in seminary in 2013 and they kept talking because they liked the same books. The two started meeting up to play Ramones covers and bluegrass standards, eventually forming a songwriting partnership that draws on folk and jazz, country and blues, blending the best of two very different musical tastes. 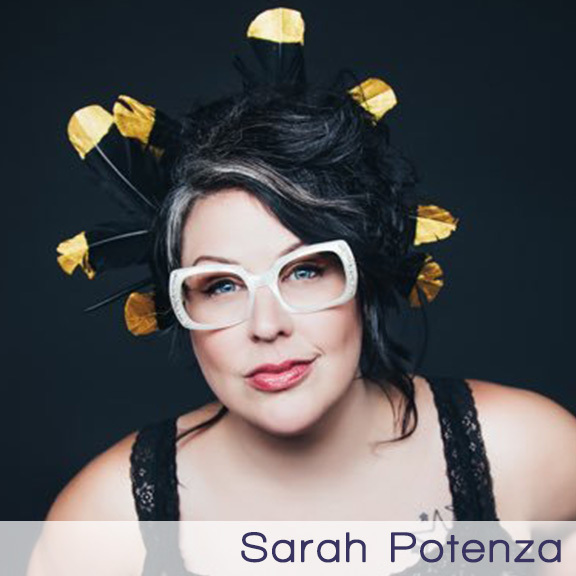 Sarah Potenza is a singer songwriter based in Nashville, Tennessee. Rolling Stone stated that “Potenza is to the Blues what Adele is to pop.” Sarah wowed judges and fans alike in Season 8 of The Voice, causing a sensation with her powerful, soulful voice. Sarah recently released an album, Monster, and she is currently touring the US. It didn’t take long for David Wimbish’s solo project to become a full band. The community that had inspired his music quickly began to embody the songs, wielding instruments last played in middle school marching band, and fulfilling the Collection’s name. 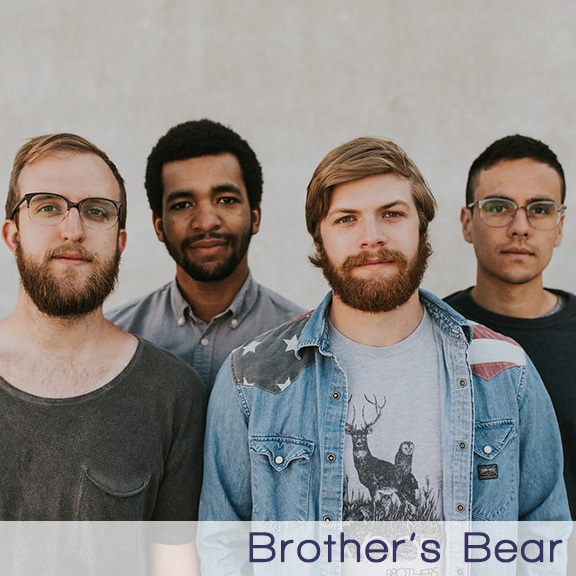 Coming from Greensboro, North Carolina, their songs stem from an awareness of their state’s folk roots, and an appreciation of orchestral and world music. After the loss of dear friends and family, the band released their first full length, “Ars Moriendi”, featuring over 25 musicians, and wrestling with questions of mortality and spirituality. As the last year has brought more focus to the Collection, both in size and in vision, and through the release of their new album, “Listen To The River,” they still retain original inspiration and muse – the community of those intrigued by the mystery of life. 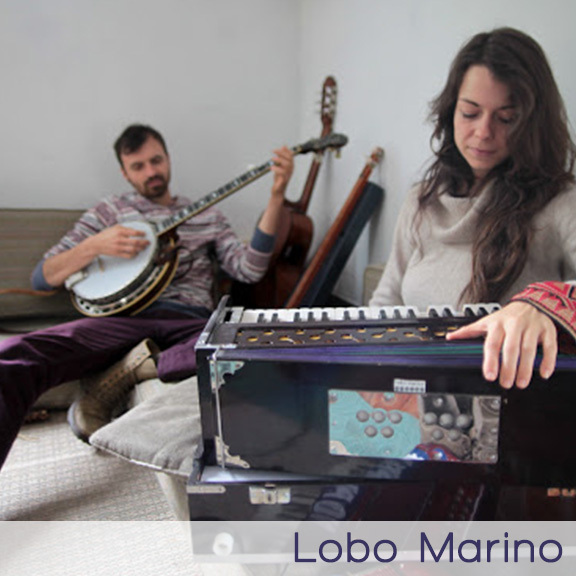 Built primarily on harmonium, percussion, banjo and various unique instruments and voices, Lobo Marino continues to evolve as the musical response to the continuous travels and ongoing spiritual journey of its members, Laney Sullivan and Jameson Price. They are also the founders of the Earth Folk Collective and Fonticello Food Forest in Richmond,VA. Deeply dedicated to environmental and social causes, when traveling they carry in their music a message of humanity’s need for reconnection with the earth. While at home, they spend time community organizing and running their donation based educational homestead The Earth Folk Collective. “Forget being signed. Paper fades. Legends don’t. I was born one.” This is what this band lives by. They started out as street musicians, filling downtown Asheville streets corners while touching many hearts . “The streets is where we love to be. We get so much positive feedback that it pushes us to work harder. This is where we started and I wouldn’t have it any other way,” said Leeda Jones(Lyric). With a sound and style that is so unique, they’re sure to please any crowd. Their album entitled, “Guitar Feet.” this album takes you on a walk through the promise of a better day. Through all hardships and struggle, this album has been known to lift people’s spirits!! 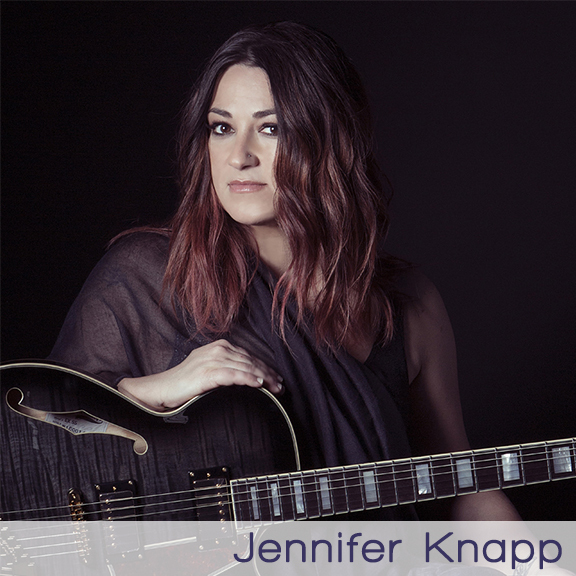 Jennifer Knapp is Dove Award winning, Grammy Award Nominated American-Australian folk rock musician. Jennifer is best known for her first hit single “Undo Me” from her debut album Kansas (1998), and the song “A Little More” from her Grammy Award-nominated album Lay It Down (2000). The Way I Am (2001), was also nominated for a Grammy. In total, the three albums have sold approximately 1 million copies. After taking a 7-year hiatus, Knapp announced in September 2009 that she was returning to music, releasing Letting Go (2010) and Set Me Free (2014). Jennifer is presently touring, and working on a new album. In addition to her passion for music, she advocates for others: in 2011, Jennifer launched Inside Out Faith, an advocacy organization for LGBTQ people of faith. A singer songwriter who’s not afraid to explore difficult subjects. 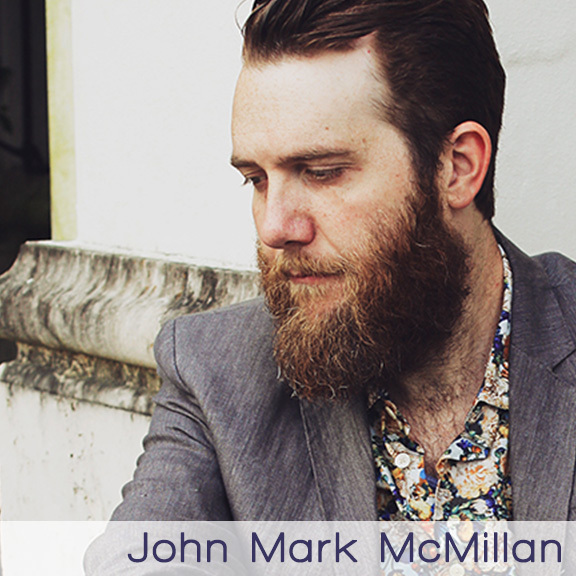 His songs, delving into deep waters are described as, “…an ongoing dialogue with God, ever-wrestling for some kind of blessing and usually at volumes most suited for rock clubs.” John Mark McMillan has performed as a solo artist for over 10 years and launched his own record label, Lionhawk Records, through which he released his latest full-length album Borderland. Don’t miss Mercury & Lightning, his upcoming release. 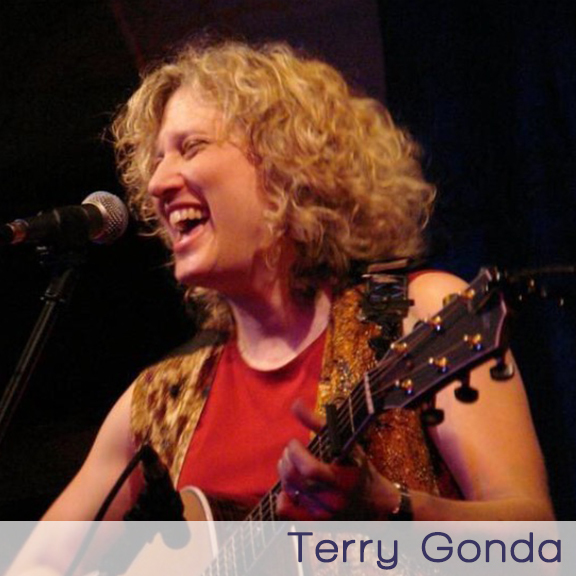 Terry is thrilled to bring her full band with musicians from Detroit and Atlanta to this year’s Goose. Their dynamic performance of original tunes mixed with select cover songs will leave you encouraged, comforted, and challenged to tell your own story of love and hope. Terry has released two CDs: “Love, Lose, Repeat” and an album of retreat theme songs, “Children of God”. Big Ray grew up in the South Side of Chicago and began his music career as a singing bartender, singing along with bands like Billy Branch and the Sons of Blues, Jody Christian, Willie Kent and the Gents, and J.W. Williams. As a solid drummer and dynamic singer, Ray was soon in nonstop demand. In 1995, Ray was asked to join the legendary Otis Rush blues band. They toured in Japan, Europe, and across the U.S. 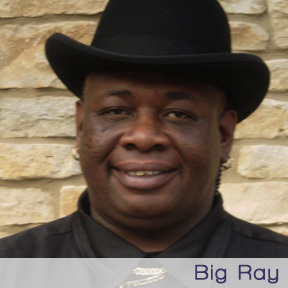 Currently, Big Ray tours with Jimmy Johnson, and also plays with his own band, Big Ray and Chicago’s Most Wanted. They’ve got a steady gig at one of Chicago’s oldest and most respected blues clubs, B.L.U.E.S on Halstead. Chicago’s Most Wanted is a band of world renowned musicians, and together they form the best of what Chicago has to offer. Melissa Greene is a speaker, singer, curator, pastor and writer. The first ten years of her professional ministry were spent traveling as an artist; seven of those years she sang as part of the contemporary Christian music group, Avalon (American Music Award Inspirational Artist of the Year in 2003, Grammy Nominated in 2005, and Dove Award Winning.) 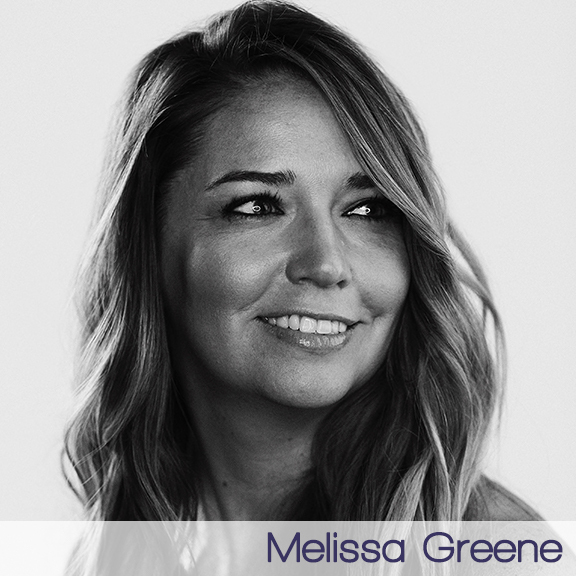 In 2009 Melissa resigned from touring and was immediately hired at GRACEPOINTE Church, a progressive Christian community in Franklin, TN. Melissa worked as Associate Pastor for 8 years at GRACEPOINTE curating the services, leading the music and arts program, nurturing the community and preaching once a month. As the Hope Curator for Timothy’s Gift (a prison outreach), Melissa produces Concert Tours with other artists designed to entertain and uplift those in maximum security prisons. She is an intentional creator fueled by her love of the beauty, truth and goodness in this world, her belief of the inherent worth of all who inhabit it. Across the years, Ken has shared his passion for learning and discovery through storytelling and music with an ever-growing circle of followers around the world. 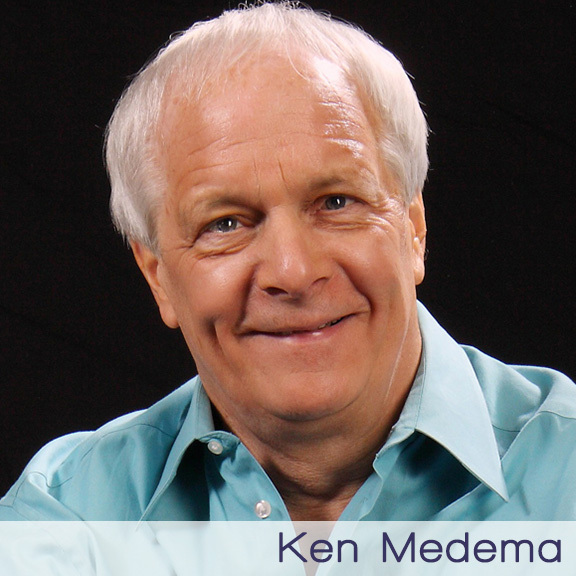 Ken has been performing for over 40 years in many different venues: churches, conventions, colleges, corporations and more, for groups ranging from 50 to 50,000 people. Though blind from birth, Ken sees and hears with heart and mind, singing stories from his audience and accenting themes and perspectives from speakers and workshop leaders. Ken custom designs every musical moment through improvisation and new composition to bring each event to life. Ken and his wife, Jane, make their home in Alameda, California. Together, they work on program designs and song lyrics, making time to explore new developments in religion, psychology and culture. They share a passion for movies (yes, Ken is an avid movie consumer), books, new music and politics, and love keeping up with two feisty grandchildren. Tuf (pr. “toof”) Francis began playing music on a single Middle Eastern drum, called a derbeki, 24 years ago. He broadened his musical repertoire over the next few years with guitar, drum kit, and song writing and recording. 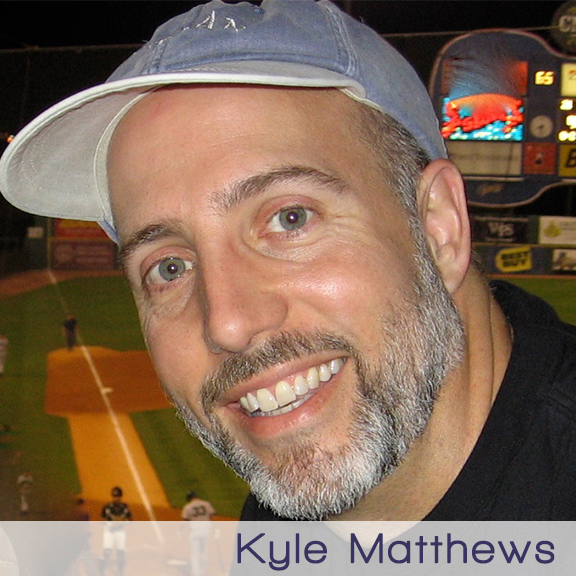 He was a public high school teacher, youth group leader, and praise leader from 1997-2007. He then took a seven-year hiatus from music to finish a doctorate in teacher education at the University of Michigan (inevitably making him an insufferable Michigan football fan). 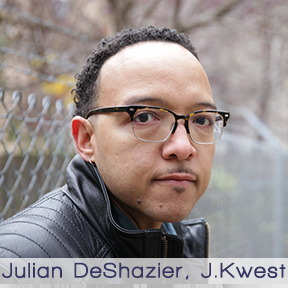 Currently, he is a family man, tenure track professor, scholar, public speaker, and active musician. His research interests focus on initial teacher certification, education program development, and building partnerships with inservice teachers. His speaking and musical efforts focus on helping churches and other organizations raise money for philanthropic causes. Check out his music video, To the Party, on youtube.com. 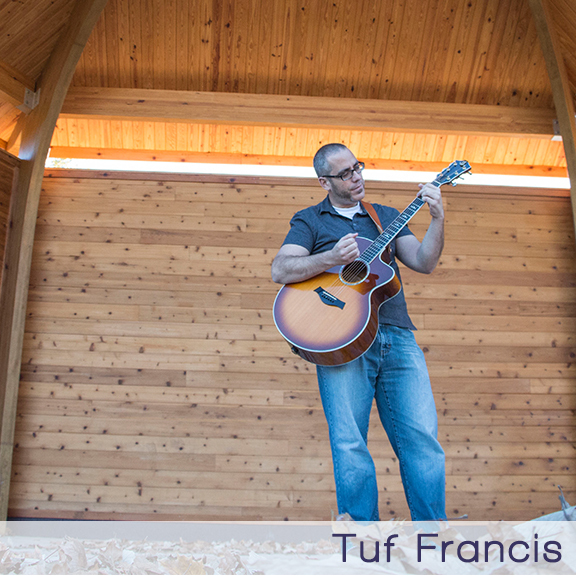 Learn more about Tuf and his music: @TufFrancis and www.tuffrancis.com. 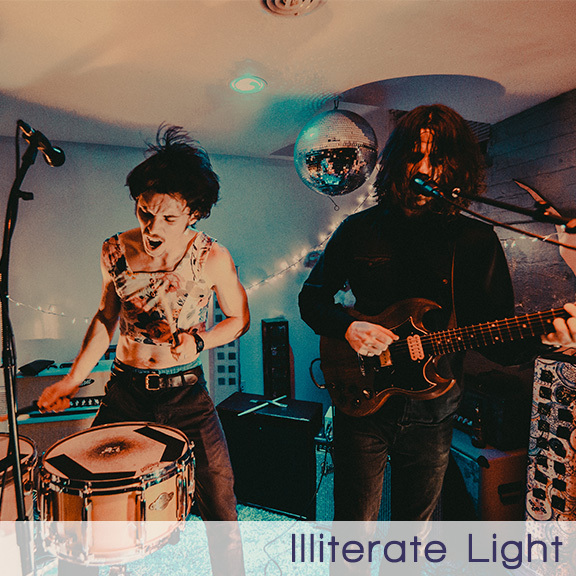 Illiterate Light is an alternative rock duet from Harrisonburg VA comprised of two best friends who strive to find the balance between late-night house shows and early morning farm chores. The Flaming Lips meets Contemplative Prayer meets Frank Zappa meets Apophatic Alternative Rock. Guitarist/singer Jeff Gorman is a student of Richard Rohr’s Living School for Action and Contemplation and plays guitar with his hands and bass with his feet as drummer Jake Cochran plays his customized drum set standing up while belting angelic harmony. Their prior Wild Goose appearance was in 2013 when they biked to Hot Springs from Harrisonburg as part of the “Petrol-free Jubilee Bicycle Tour.” They write about everything from non-duality to social justice to millennial dating norms. 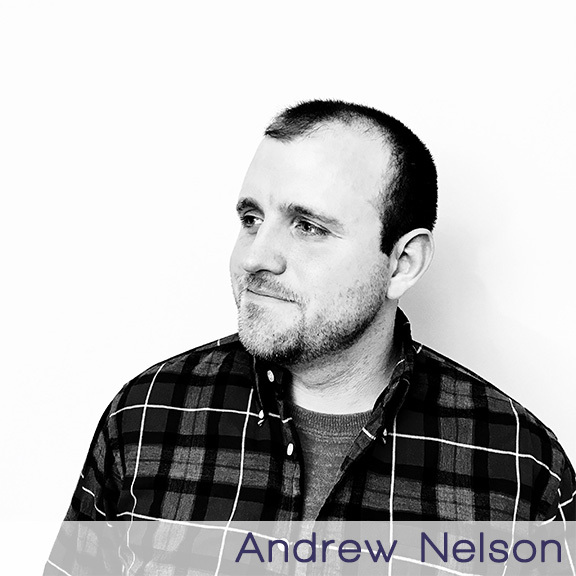 Andrew Nelson is a singer/songwriter from Holland, MI. Playing music that meditates on themes of love, loss, hope, and redemption, Andrew has been writing and performing music for the past 10 years. His music is best described as Contemplative Folk. When he’s not working on his own music, Andrew is usually found in his studio working with his production company, Far Room Productions. Charles Pettee & FolkPsalm invite you to sing, dance and pray with us, as we offer 3,000 year old poems and songs of justice and mercy to all who work for justice and mercy today! 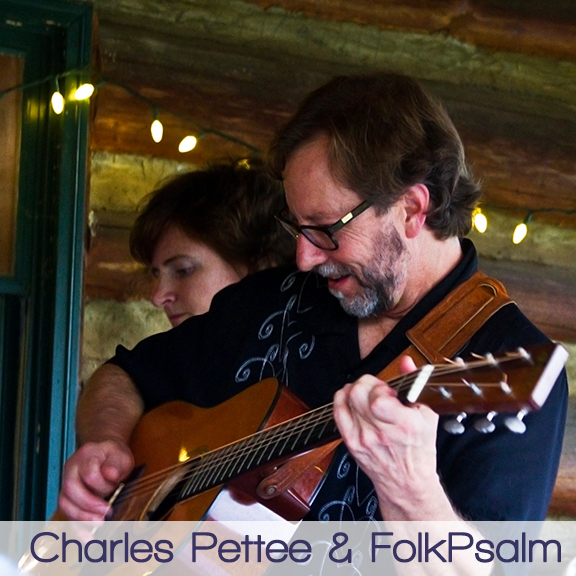 The FolkPsalm Trio is Charles Pettee (guitar, vocals), Brittany Whitmire (vocals), & Terry Allebaugh (harmonicas), who – along with your participation and laughter — bring these prayers to life. “The Psalms have not sounded fresher or more urgent since the day each of them was first sung,” writes Dr. Ellen Davis of Duke Divinity School of Pettee’s original musical settings of these Scriptures. Come hear the Psalter sung bluegrass-style; dancing is encouraged! “A Dove on Distant Oaks: Psalms for the Journey” is the fourth and latest album from the group, continuing their quest to share the good news of God’s never-ending love, offering sustenance for the never-ending quest for justice, through song, dance, and prayer, as modeled by these sacred poems and prayers. 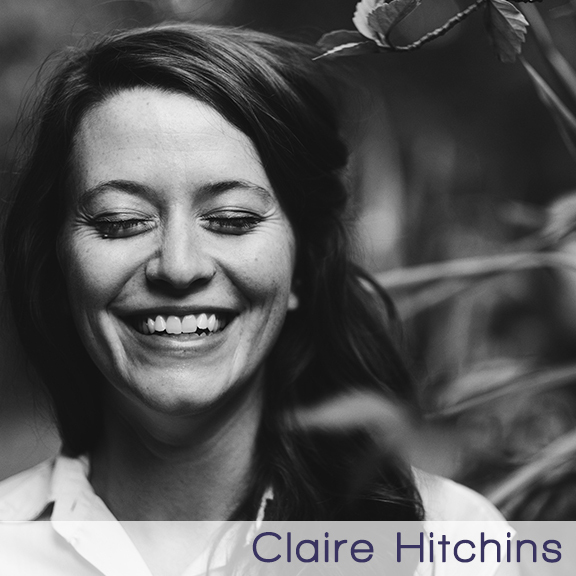 Claire Hitchins is a learner in life whose journey of radical discipleship has led her from food justice work in Richmond, Virginia to living among marginalized communities in Cochabamba, Bolivia, making an ancient pilgrimage across Spain to accompanying immigrant farm-workers in central Washington. 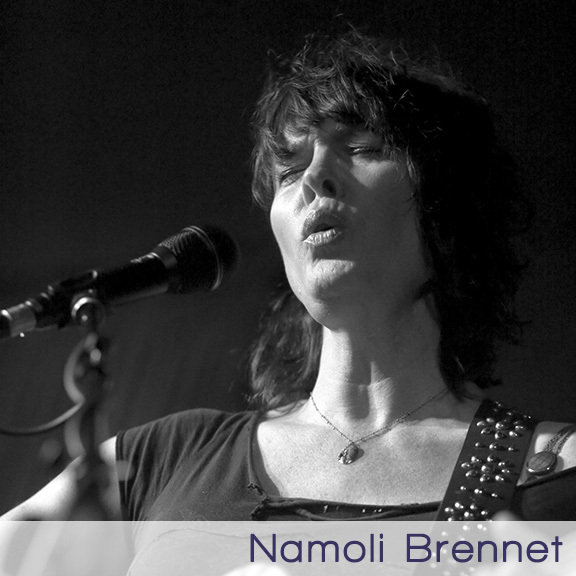 In December 2015 her original music was featured on the blog of On Being with Krista Tippett, initiating a leap of faith into new musical pursuits. She recorded her debut album, These Bodies, which she self-released in October 2016. When she’s not on the road offering her music as medicine, she can be found at home at Charis Community in Charlottesville, Virginia, co-cultivating generative, resilient and healing lifeways in resistance to empire. Claire received her BA in Religious Studies from The University of Virginia in 2013 and served with Jesuit Volunteer Corps Northwest ’15-’16. 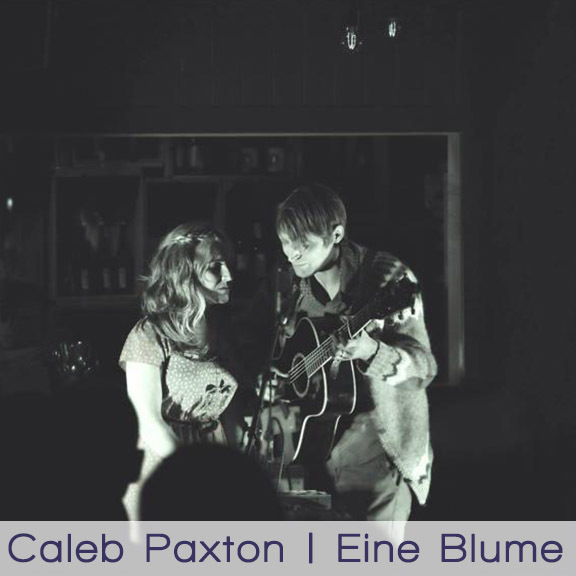 Eine Blume is Missouri based wife and husband folk duet, Erin and Caleb Paxton. Their songs are intimate, atmospheric and soulful. Someone once said, “..like ascending into a warm velvety fairy tale”. They spin their words and melodies from faith, parenthood, poetry, living and dying. 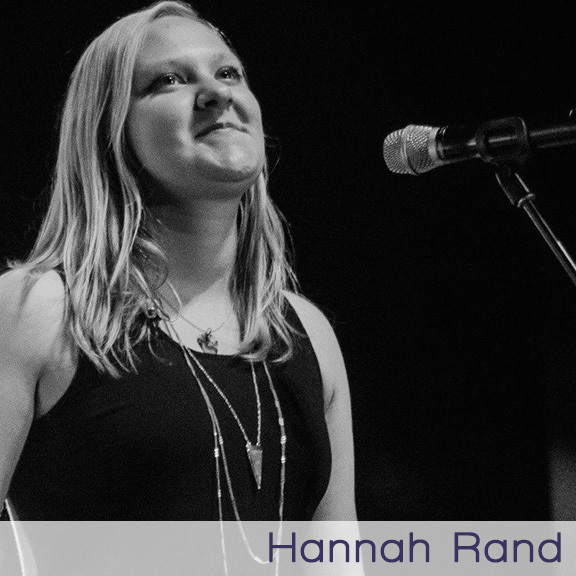 Hannah Rand has been writing songs and performing since she was 12, winning a Grammy Foundation songwriting award while still in high school. 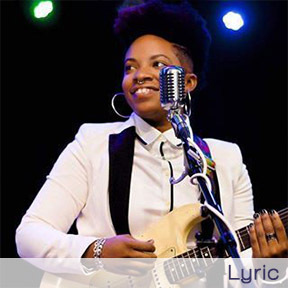 Her first year at Belmont University she won the highly competitive ASCAP/Belmont Best of the Best show – unprecedented for a Freshman – and continued to win awards throughout college. Her senior honors project was a deep dive into classic songs from master songwriters like Dylan, Springsteen, Joni Mitchell, The Beatles, and Adele. The result was the recently-released, “Standing on Shoulders,” a beautiful and emotionally compelling album of 6 covers and 6 originals. 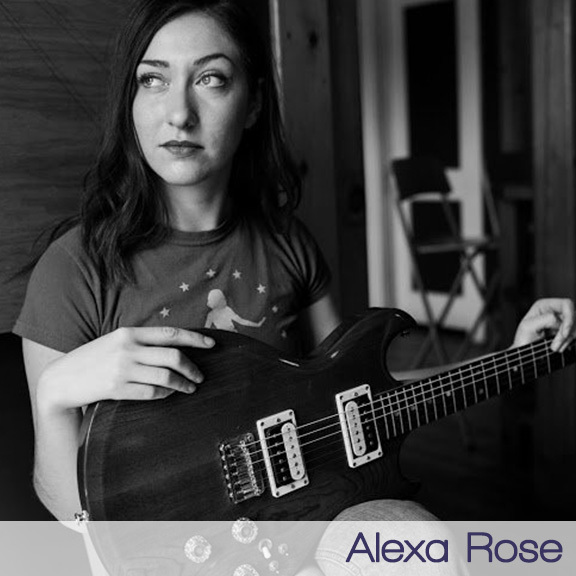 Sometimes compared to a young Sarah McLachlan, this 22-year-old is still uniquely her own person, with an indie pop/folk sensibility in her arrangements, and a musical sophistication beyond her years. Hannah’s also a lead singer in the alt worship band, The Many, and writes most of their songs. 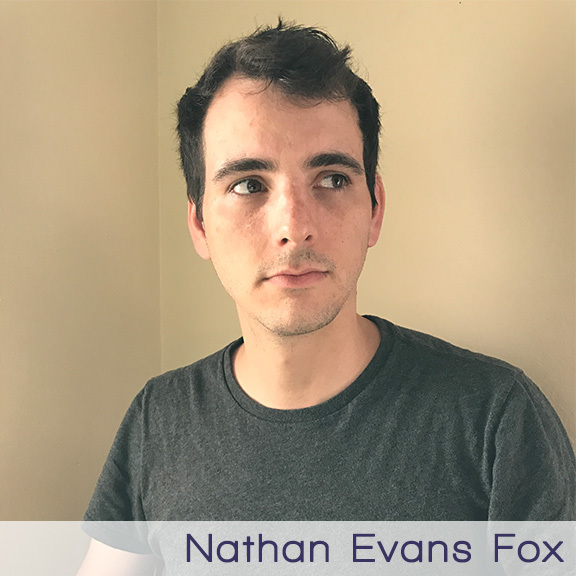 Nathan Evans Fox is an Americana/folk musician from Glen Alpine, North Carolina, where he grew up surrounded by country, folk, gospel, and Americana. These roots form the rich undercurrent of his music, which combines bluegrass riffs, folk stories, and religious imagery with unorthodox layers of sound and a heavy dose of wit. Fox has been writing music for ten years, experimenting with a variety of genres and learning new instruments along the way. He has collaborated with other artists as a fiddle player, guitarist, and vocalist. His lyrics confront political, religious, and personal inconsistencies (even his own), but also offer a meditation on what it means to live with and love another. Fox wrote, performed, and produced his first full-length album “Home,” which was released in January 2017. He lives in Houston with his best friend/wife Elizabeth and their dog Maisie. 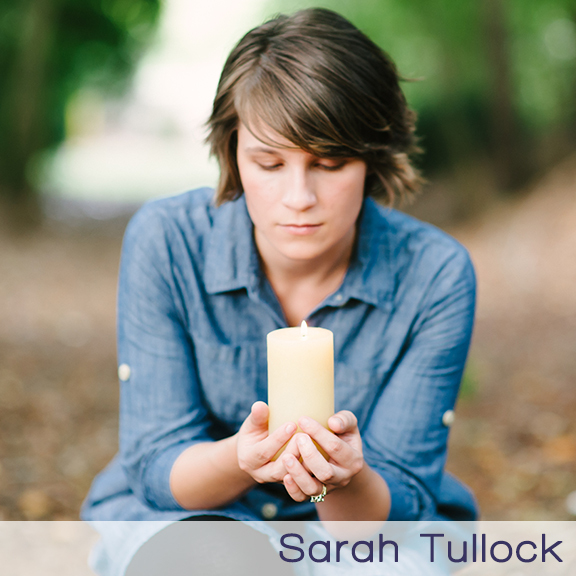 Sarah Tullock is a singer/songwriter living in Chattanooga, TN. She also teaches public school music using a joyful curriculum of folk tunes from around the world to inspire a love of music literacy in her students. Her pen name, “OneLittleLight,” comes from that beautiful passage in John 1, which references the true Light that cannot be overcome by any darkness. 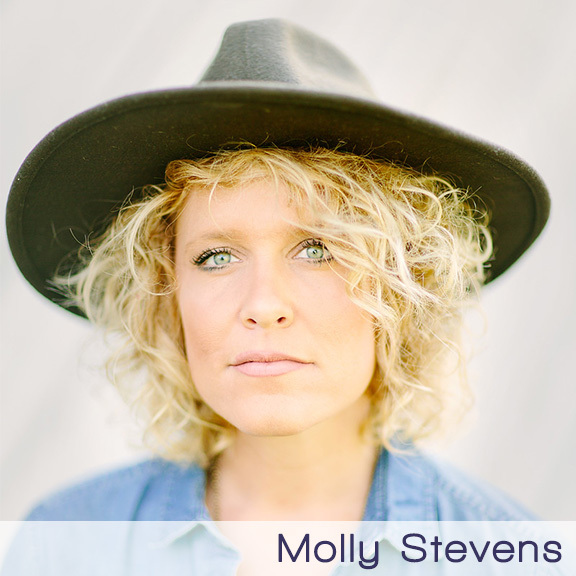 She loves to share songs about faith, humanity, and light with anybody anywhere, and most certainly with you! 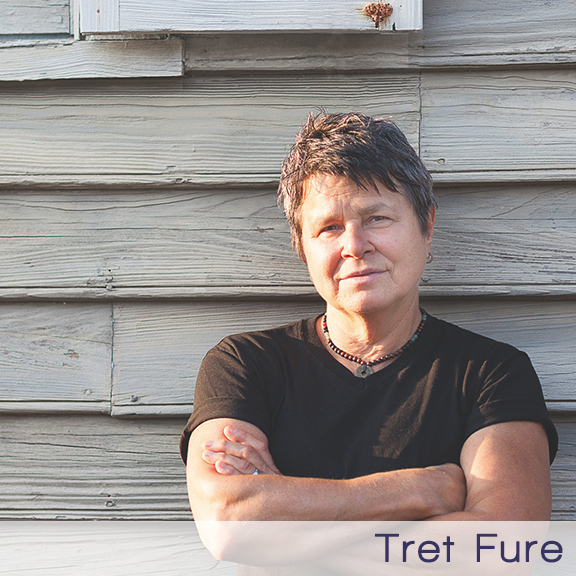 Tret Fure has released 15 acclaimed albums in her 47 year career. Her latest, “Rembrandt Afternoons” is receiving stellar reviews. In addition, Fure has engineered and produced a variety of artists, including herself. Some of the awards Tret has won include The South Florida Folk Festival Singer/Songwriter Competition in 2 out of 3 categories, the Jeanne Schliessman award for Outstanding Contributions to Women’s Music. and “Pride In The Arts Favorite Female/Lesbian Musician”. She is number 3 on the top 20 CD charts for OitVoice.net and is number 1 on Reverbnation in the Hampton Roads area..
Tret markets her own line of clothing, teaches guitar and songwriting individually and in workshop settings and paints pet portraits on commission. Along with bridging the marketing, production, art and music worlds, Tret is President of Local 1000, The Traveling Musicians Union. She is truly a Renaissance woman! 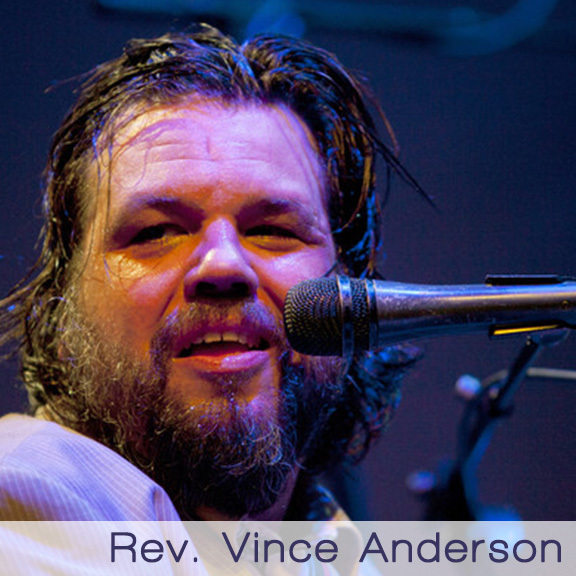 Born in Fresno, California (the raisin capital of the world), Vince moved to New York City in 1994 to study at Union Theological Seminary with the intention of becoming a Methodist minister. The Reverend lasted three months in seminary, before sensing a new direction to take his music and message to where the people were – into the bars and taverns. The Reverend calls his music, “Dirty Gospel”, a term reflecting both his musical influences and his theological perspective. He has released four albums, as well as playing a weekly show in New York City for over 20 years with his Brooklyn based band “The Love Choir”. He’s toured internationally as well as playing with artists such as The Roots, Daniel Johnson, and Melvin Van Peebles. 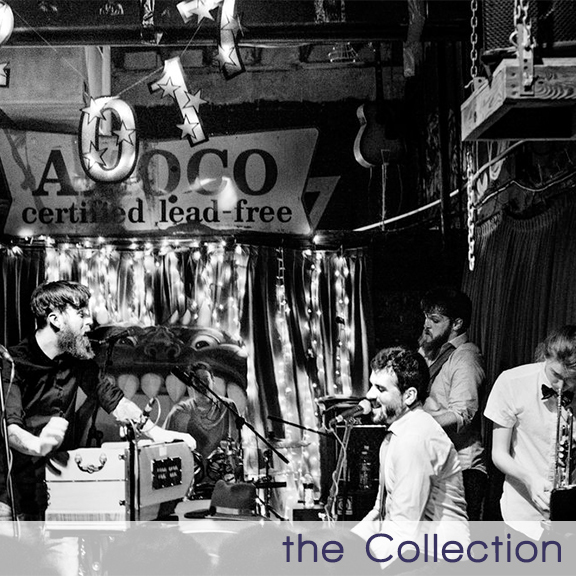 His band includes members of TV on the Radio, Run the Jewels, Nick Waterhouse band, and Burnt Sugar. Rev. Vince is currently setting the book of Psalms to music. Based out of Seattle, WA, Poor Clare creates original music inspired by the mysteries of God and life. Poor Clare’s music echoes the beauty of the Pacific Northwest: melodies that soar from the peaks of the mountains, lyrics exploring ocean depths, textures that rain from the clouds like a dream. 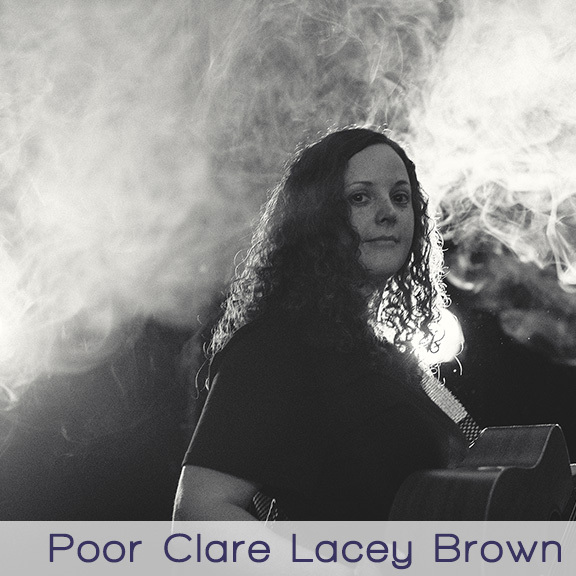 Led by songwriter and performer, Lacey Brown, Poor Clare invites you along on a musical journey reflecting the beauty and pain of life. The name is inspired by Clare of Assisi who (with St. Francis) founded a second monastic order that was later named the Order of Saint Clare (or, the Poor Clares). May these songs be a source of light and hope in a world that is often too dark.